It has been 5 years since we first warned of a looming pensions crisis in Boom, Gloom and the New Normal. Now, finally, it is becoming a mainstream issue. The latest round of central bank stimulus policies has clearly been the proverbial “straw that breaks the camel’s back” for anyone connected with pension funding. “Common sense tells us that demographics, not monetary policy, drive demand. Unfortunately, vast amounts of time and money have been wasted as a result. It is good news that mainstream media are now focusing on the pensions crisis. Nothing can be done whilst central banks are allowed to pretend that monetary policy can magically restore the economy to SuperCycle growth levels. “The Boomers have moved on from being a high-spending generation. Instead, they are becoming a high-saving generation, as they need to save more to survive a longer retirement. And therefore the failure of the various government stimulus programmes since the crisis began should be no surprise. The concept of pent-up demand is now wishful thinking. It is really no surprise that the US economy is struggling, given these figures. 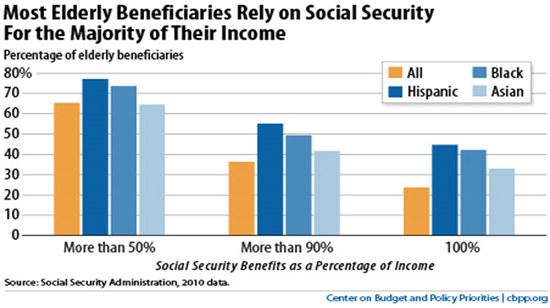 □ More than 1/3rd of all retirees rely on Social Security for 90% or more of their income, and 2/3rds rely on it for more than half of their income. □ This makes no sense, in the light of John Williams’ conclusion that “interest rates are going to stay lower than we have come to expect in the past“. So here’s the nub of the issue. The Fed, like other major central banks, is close to admitting that its monetary experiments have failed to produce the expected results. The next Administration will therefore be faced with a need to unwind many of the policies put in place since the financial crisis began 8 years ago. It has always been obvious that the Fed could not possibly control the economic fortunes of 321m Americans. 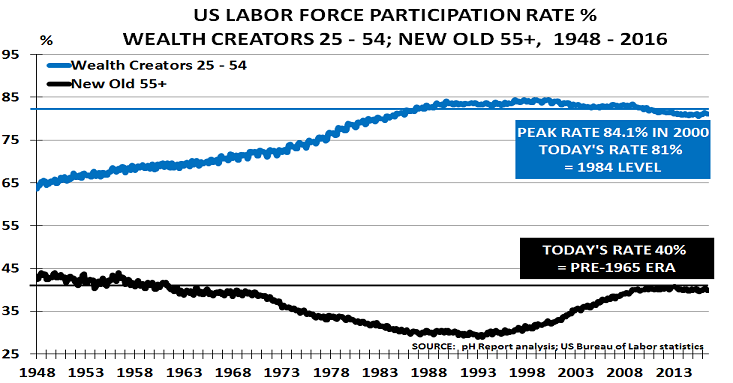 Common sense tells us that demographics, not monetary policy, drive demand. Unfortunately, vast amounts of time and money have been wasted as a result. The path back to fiscal sanity will be very hard indeed. The Western BabyBoomers (born between 1946-70), have been one of the luckiest generations in history. By and large, they have escaped the major wars that have plagued society down the ages. They have also lived in a world where living standards and material wealth have made astonishing gains. Equally priceless has been the rise in life expectancy, which means the average 65 year-old can now expect to live another 20 years. But politicians didn’t want to acknowledge the impact of this shift in life expectancy on the economy. Nor did central bankers want to reveal that it was demographics that created the long economic SuperCycle between 1983 – 2007 (when the US suffered just 16 months of recession in 25 years). That would have spoiled the myth of their genius, and the forecasting ability of their supposedly all-powerful Dynamic Stochastic General Equilibrium economic models. “A shrinking workforce cannot foot the pension bill”. But now, the Boomers’ luck is running out, at least in the UK. The warning sign was seen in 2008 with the financial crisis. This highlighted the fact that today’s ageing population are creating a “replacement economy”. Monetary policy is irrelevant when confronted with the fact that 65-year olds do not have the same spending power as when they were 35. Equally important is that they now own most of the things they were buying when they were younger. But it would be too embarrassing for central bankers to admits they had been lucky rather than clever. Now the Brexit vote is bringing the chickens home to roost. Last week, the Bank of England put on its “Superman” tunic again – deciding to take interest rates even lower, and weaken the value of the pound. They chose to ignore the fact that their action probably created a “disaster scenario” for pension funds. As Altmann warns, this deficit will have real world consequences. Either employers will have to increase their contributions, or pensioners will not get their promised pensions. Both outcomes will have negative consequences for the UK economy, as they will either reduce company profitability or reduce pensioners’ future spending power. One also cannot ignore the potential for political fall-out if pension funds fail to meet their commitments to pensioners. The problem is that the Bank – like its peers in Europe, USA and Japan – loves to be the centre of attention. It therefore chooses to ignore the fact that by creating further artificial demand for gilts in the short-term, it is creating major economic and political risks for the medium and longer term. And as we all know, there is a moment when a medium-term risk becomes short-term reality. We may not be too far away from that moment now, as millions of pensioners start to realise their pension funds may well go bankrupt. Pensioners, and those who expect to be pensioners, are of course in the direct line of fire as this trend continues. Pension funds, and life assurance companies, have always been major buyers of long-dated high-quality bonds, as this is the least risky way for them to meet their liabilities. Similarly, advisers have always told investors to move into government bonds as they approach retirement, in order to achieve financial security. 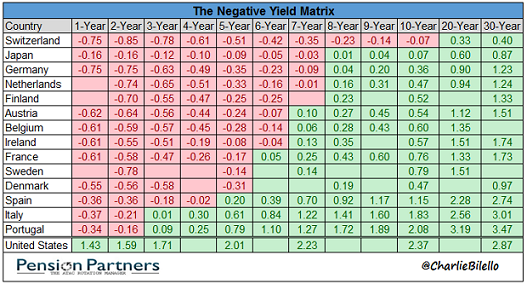 The collapse of yield thus highlights the uncomfortable fact that many pension schemes are no longer fit for purpose. They were developed in a different era when the majority of people never reached pension age, and when life expectancy at pension age was relatively short. Neither Bismarck in Germany, or Lloyd George in the UK, or even Roosevelt introducing Social Security in the US during the Depression, would have dreamed that their concept of a modest form of social insurance would become an universal benefit. Corporate pension schemes face even more problems, given the pressure from investors to prioritise dividends over pension fund contributions. The UK Pensions Regulator recently reported that more than half of FTSE 350 companies have paid 10x more in dividends than they spent on fixing their pension fund deficits. And the problem is far worse after the Brexit vote, which caused government bond yields to tumble even further around the world. 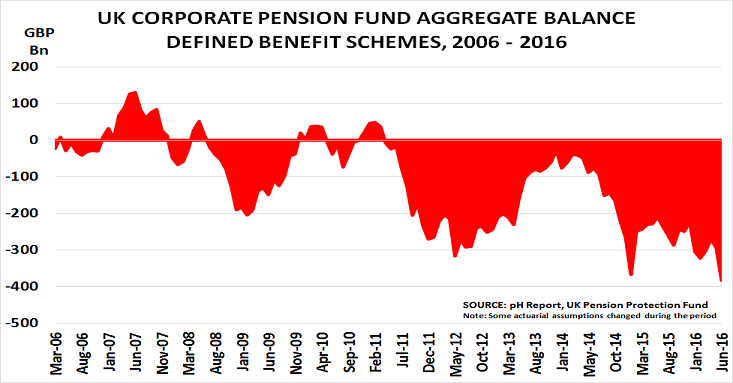 UK corporate pension fund deficits rose by 30% in June, to a record £385bn ($506bn) according to the Pension Protection Fund. The New Old 55+ age group will be equally unhappy that politicians have failed to warn of coming problems. This matters enormously, as the second chart shows, given that around two-thirds of older Americans rely on Social Security for the majority of their income. And the problem is compounded by the fact that public pension funds are having to cut their forecasts for investment returns back to the levels seen before the SuperCycle began – and every 1% cut in return targets increases pension liabilities by 12%. US pension income is already well below median earnings of $42k. In 2014, men received $18k in median pension income according to a new report from the National Institute of Retirement Security, whilst women’s historically lower wages mean their income was only around $12k. A similar differential can be seen in 401(k) savings, with men having $37k invested versus $25k for women. Average spend per person on both programmes will be 50% higher than today at $18k and $12.5k respectively. Instead, of course, policymakers around the world chose to pretend that monetary policy could somehow fill the gap caused by demographic change. 18 years later, voters are about to start waking up the results of that choice. Either taxes will now have to rise to pay the bills, or benefits will be cut, or a mix of these 2 options will take place. 10k Americans have been retiring every day since 2011, and 18k Europeans, as the BabyBoomer generation reaches the age of 65. But pension schemes have not adapted to the fact that average life expectancy is now 20 years at age 65. This is causing major problems for the economy as pensioners leave the workforce – and placing a increasingly large burden on the younger generation who have to fund their pensions for the next 20 years. The problem is that these changes have happened within just a few generations. It is not all that long ago, relatively speaking, that life for people even in the developed world was “nasty, brutish and short”, as author Thomas Hobbes had written in 1651. When we first began to write ‘Boom, Gloom and the New Normal’, we assumed policymakers fully understood the economic impact of today’s ageing populations. It seemed just common sense – more older people, all spending less, and fewer young people inevitably meant slower growth and probably deflation. Increasing life expectancy is, of course, great news for us as individuals. But for the economy, it means that yesterday’s ‘demographic dividend’ has turned into a ‘demographic deficit’. Now many pension funds are having to face the fact that they risk not being able to pay out the promised benefits. As the chart shows from the Wall Street Journal, most US state pension funds are now being forced to reduce their expected annual returns on investment. This means that local and state governments will have to increase their payments – either by raising taxes, or cutting spending. And many analysts worry the assumed returns are still too high – which could mean more funds having to cut actual pension payments as in Detroit. Nor is the US alone in this problem. 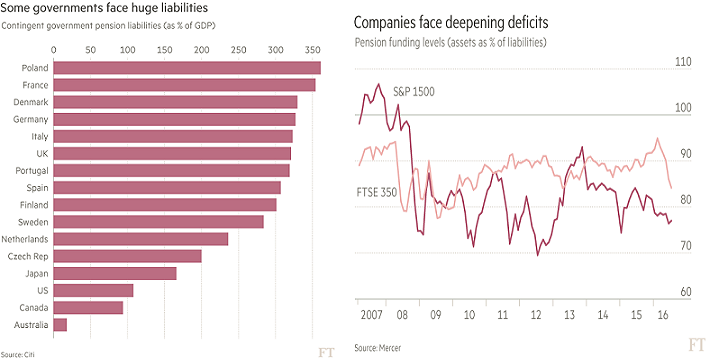 In the UK, 4500 corporate pension schemes are in deficit, compared to only 1750 in surplus. Major telecoms utility BT is in even worse shape, with its £47bn ($72bn) pension fund now 150% of its entire market capitalisation. In Switzerland, pension experts expect the national fund to be bankrupt within 10 years. There is no easy solution to this problem. But the longer it is ignored, the worse it is going to get.